This style guide applies only to official ACC websites and pages. 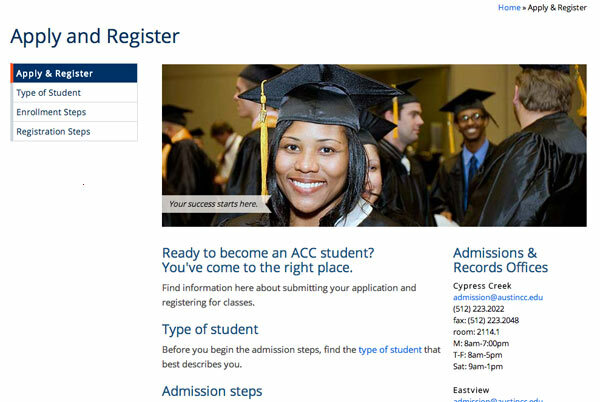 Official ACC websites and pages are defined as web pages on an ACC web server that have been created by ACC, its academic departments, administrative offices and other areas. Write your website for a single audience rather than multiple audiences. Link to information that exists elsewhere on the ACC website rather than re-creating content. Web page content should be written for the long term and avoid dates and time-specific information such as “starting this fall” or “because of changes to policy.” Reserve this type of information to newsroom or other announcements. Many times, maintenance of content can be more difficult than the initial creation of content. Develop a plan to maintain content before publishing content. Establish a consistent schedule to review and maintain web content. Some pages need annual updates; others need monthly or daily work. Set a schedule and follow it. Remove outdated content and archive it on another storage device. Consistently update specific dates on pages if dates are indeed listed or cited. Pages that are incomplete should not be published to the web. Users become frustrated by “more information coming” messages. Editorially check content for spelling, grammar, proper style, and correct errors. Check that the page works across browsers (e.g., Internet Explorer, Firefox, Safari, Opera). Note: IE6 is no longer officially supported. Make sure the page meets basic accessibility requirements. Please verify you have a release form for every person identifiable in the image. Never use an image in place of text. Pictures should always include an “alt” tag, which provides a description of what’s happening in the picture. These tags are often read by screen readers to help seeing impaired people understand what’s in the picture. Pictures without proper alt tags may be subject to removal. Photography should feature actual ACC students, faculty, and staff. Use images provided by Public Information and College Marketing if possible. Links to PDF’s and other non-web documents will point off-site to the website owners Google Drive account. Instructions on how to do accomplish this are available here. PDF links should point to content that should be intended to be print such as forms and brochures. If content can be inserted into a website post or page, work to do so. 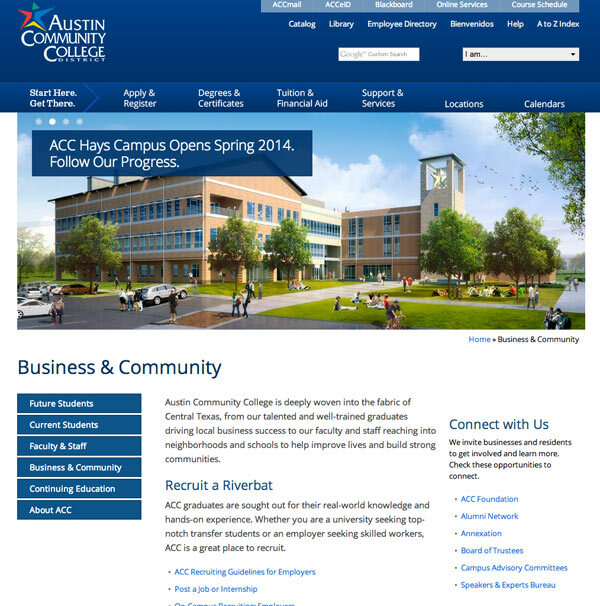 The Austin Community College name, logo and trademarks, wordmarks, slogans and other identifying symbols are the property of the Austin Community College District and are protected by federal and local copyright laws. Commercial use and reproduction without express written permission is strictly prohibited. The official logo or trademark of Austin Community College is the ACC star used in conjunction with the name of the college. The ACC star symbolizes vitality, growth, and progress. It speaks to the energy of knowledge unleashed when students are empowered by learning. The logo represents the college in the community, internally and externally, locally, regionally and nationally. It must be used in all instances of marketing and identification of the college. The logo must be used according to the college’s approved graphic standards. It is the official trademark of Austin Community College and must be reproduced from original artwork. Only the official, approved version(s) of the logo are appropriate for use. Public Information & College Marketing is responsible for establishing and maintaining these graphic standards. It is not permissible to change the typeface of the logo or alter the proportion or composition of the logo in any way. The logo must appear in its entirety. The logo includes both the star emblem and the name of the college, in the correct typeface and specified colors. The two elements are inseparable and unalterable. The star should never be used on its own; nor should the name of the college be shown in the typeface and configuration of the logo without the star. It must not be rekeyed, redrawn, reproportioned, added to, or modified in any way. The logo should appear large enough for the text within the logo to be readable and the graphics are to be undistorted. The official font for ACC websites is Open Sans. This font should be used for all website text including headings, body copy and any specialty content areas. The fall back font for Open Sans is Arial. There is not an official serif font approved for web use at ACC. If you need to use a serif font on the web please use Domine. It is close to the Century Schoolbook font that is used in official college publications. The official ACC color PMS 280 (print) and HEX #002B7F (web). Public Information and College Marketing recommends the following color palette. Colors are shown as 100% opacity, but can be incorporated into varying percentages, as long as text readability is maintained. Photography should feature actual ACC students, faculty, and staff to show the brand value Community. Limit stock photography to objects and concepts, unless there is no alternative. Contact Public Information & College Marketing if you need photos of students, alumni, faculty, or staff. Select focus on individual(s) with a positive emotion shows the brand values Empowering, Supportive, and Valuable. A natural, genuine setting and moment shows Accessible and Supportive. There should be a professional look to the photography to show the brand values Empowering and Valuable. Please visit this private folder to download photos of students, faculty, staff, and ACC campuses. Banner images are defined as the main image that appears at the top of a webpage above the content area. These can be executed as full width or 3/4 width depending on the nature of the content and the focus of the page. Banner images should reinforce the content on the page and meet the standards of the photography requirements stated above. Graphics and other non-photographic elements can be used as banner images on an as-needed basis. These graphics must be approved by Public Information and College Marketing prior to use. Buttons are a big part of users access the web. No matter how your button looks whether it’s skeuomorphic, flat design-based, or some other representation, it should have a clear purpose that conveys to the user what happens when the button is clicked. Some examples are : “Submit”, “Download”, “Register”, “Chat Live” and so on. Description of event. Include any extra information a user will need to complete the action of registering. Be sure to limit the button text to one or two words to avoid confusion. A header or a short explanation is sometimes needed to convey what the user is supposed to do next if it is not apparent. Violating the privacy rights of others is prohibited. Embedded content must not contain personal, private, or confidential information that is not directly relevant to the mission of the institution. Commercial transactions, advertisement, and unauthorized use of copyrighted material is prohibited. Embedded content must not contain information that is in violation, or promotes the violation of any local, state, or federal law.